Bobby Doran and cook Jen Ladynski with a sample of yummy meals. Not-for profit organisations not only provide services for the wider community, they also give volunteers a much needed boost in life. 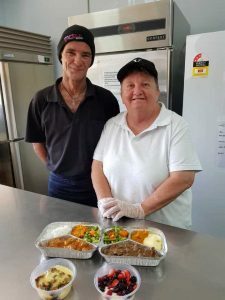 Cooloola Coast local Bobby Doran dons an apron a couple of times a week and gets his helping hands busy in the Tin Can Bay Meals on Wheels kitchen. He’s currently working his way through a Cert 3 in Hospitality and afterwards Bobby is hoping to get into the workforce. As the sole parent of his 9-year-old son he hopes to find family-friendly employment and provide a future for his boy. Both are super impressed with his dedication to the role, he even shaved off his trademark beard for the position! Bobby said it felt great to give back to the community and is interested in staying on as a volunteer after his training. In his down time Bobby enjoys the outdoors, either fishing or kicking a footy with his boy. If there’s anyone wanting to snap this keen worker up then give Michelle a call on 0427 701 922. ….and they have a new committee! Our new President, Convenor is Julie Arnold, Vice President, Assistant Treasurer is Julie Thorne, Treasurer Linda Munce, Secretary Michelle O’Gorman and Assistant Secretary Suzanne Fountain. We would like to thank Mike Clifford for his services to Meals on Wheels for the last seven years, Annette Dowie for standing in as our cook recently, Cr Mark McDonald for his Honorary Membership and our new Life Members for their continued service for the past 80 combined years: Beryl Murray, Dawn Gant, Robyn McAndrew and Kathy Reibel. Councillor. Everyone enjoyed a lovely lunch provided by the committee at the AGM, with a great turnout of 40 people. Now delivering to Rainbow Beach, we hope to welcome more clients with our dedicated volunteers, happy to deliver across the coast. See you at the Tin Can Bay Markets for our sausage sizzle – remember, supporting us puts money straight back into our community! Congratulations – you are a lifesaver!